It’s amazing when friends and loved ones shower you with sweet wishes and messages on our birthday. Sometimes these messages can even mean more than the gifts you receive on that special day of yours. Apart from the good feeling that these birthday wishes bring, they also tell you how much your loved ones think about you and appreciate your friendship or presence in their lives. And when loved ones send you birthday wishes, it is only fine that you reciprocate by thanking them for their wishes. But sometimes we fall short of words to say thank you. 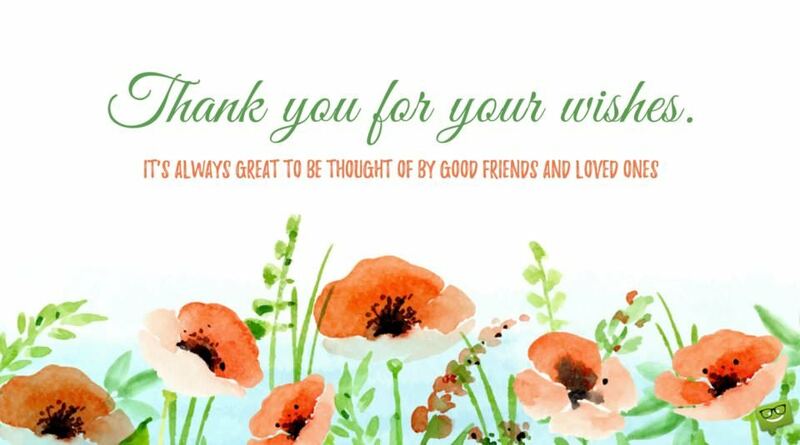 If you often find yourself in that situation where you want to say thank you to your family and friends for the birthday wishes they sent you but don’t know how to come up with very meaningful messages to express your gratitude, this page is here to help you. Birthdays are one day events but your wishes will forever remain in my memories. Thank you very much. 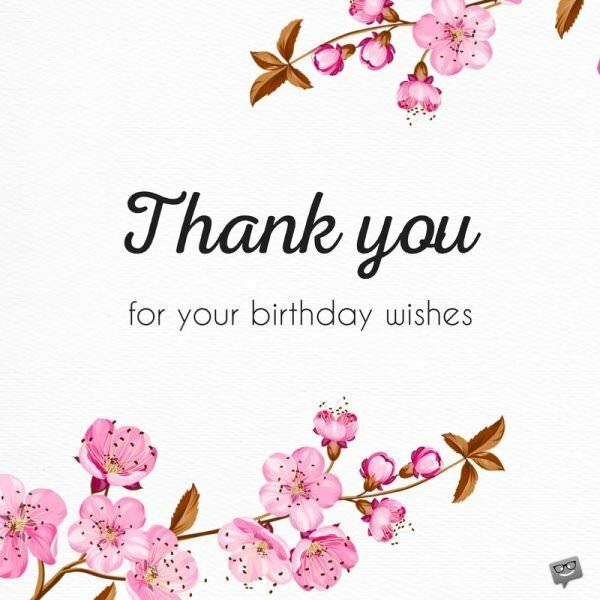 Thank you for the sweet wishes on my birthday. I couldn’t have asked for better gifts than those beautiful messages and wishes. Thank you all. No amount of money can buy the joy your wishes brought to me on my birthday. You have made me realize how much you cherish our friendship. 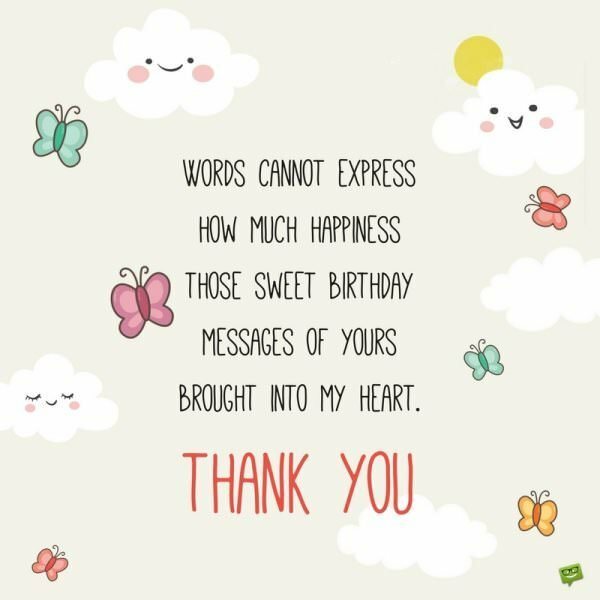 This goes to everyone who sent their sweet wishes on my birthday. I am overwhelmed by the love you guys showed me. My birthday wouldn’t have been enjoyable without the sweet wishes I received from great friends like you. Hello, everyone! Your birthday wishes are cuter than any gift, sweeter than any cake and brighter than the light of any candle. Good things do not last longer but your birthday wishes would be remembered throughout the whole year. I truly appreciate the love. Those birthday greetings were truly beautiful. I love you all for making my birthday one that I will never forget. Your birthday wishes mean so much to me, and I will never forget how special those words made me feel. Thank you, guys, for making me feel so special and loved. Those fabulous birthday messages I received from you turned my birthday into one of the most wonderful experiences of my life. Guys, you are the best! Words cannot express how much happiness those sweet birthday messages of yours brought into my heart. May God bless you all for taking some time out of your busy lives to send me such thoughtful messages. My birthday was fabulous thanks to your extraordinarily beautiful wishes. I had the happiest birthday of my life because of the heartfelt messages and wishes I received from you. Those wishes made every moment of my special day super delighting. Your sweet messages indeed brightened my special day and caused my heart to overflow with happiness. I cannot put into words how much those beautiful words meant to me. Yesterday was a big moment in my life, and you, guys, made it even bigger with those lovely wishes. Thank you very much. You have shown me the value of friendship with these cute birthday wishes of yours. I am glad to have such amazing friends like you. You filled my heart with so much joy with your wonderful birthday wishes. I don’t think I will ever forget those sweet messages for as long as I live. Thank you for the impact you made on my birthday with those lovely wishes. I feel like the most important person in the world thanks to all of you! Allow me to express my profound gratitude for gracing my birthday with your beautiful wishes. They mean so much to my life. Just like the way you remembered me on my birthday, you will be remembered in the treasures of my memory. Thank you. Gifts will fade with time but your wishes will be inscribed on the walls of my heart forever. Thanks, everyone. All the awesome wishes and messages you sent on my birthday made me feel like the King/Queen of the world. Thank you so much, guys. Love you! Just like the fragrance of a perfume lingers for a long while, your birthday wishes will linger in my heart for years to come. Thank you. Thank you for spicing up my birthday with your lovely wishes. You guys are indeed the best! My birthday was truly magical thanks to the beautiful messages and wishes you sent me. I appreciate every single wish that I received. May God bless you all. Thanks. I hope all of you lovely souls receive in multiple folds the good wishes you sent me on my birthday. Thank you very much. It’s nice having people like you to wish me wonderful things on my birthday. I am nothing but grateful for your love. Thanks! Thank you for your amazing wishes. It was a birthday full of joy and happiness thanks to you. It wouldn’t have been called a happy birthday without your beautiful birthday wishes. I am grateful for your love. Those were some cute birthday wishes from awesome friends like you. Thank you very much. I want to use the opportunity as good reminder of how grateful I am for your beautiful birthday wishes. Thanks for sharing in my joy. You, guys, are too awesome! Your wonderful birthday wishes I have a book full of your lovely birthday wishes. Thank you for making my birthday feel very important and special. You got me spoiled throughout the day with your lovely birthday wishes. Thank you, guys. You rock! Thank you all for making me feel super special on my birthday. Those were some really awesome messages you sent me. Words are not adequate enough to express the joy of seeing your sweet wishes flooding my timeline. I feel special already. Thank you, guys. I have lost count of your beautiful birthday messages. They are simply overwhelming. Thank you so much. I cannot thank you enough for the great gifts of wishes you gave me on my birthday. I am so grateful for your love. Thank you so much. This is to say thank you to all of you who took time to send me birthday wishes and messages. They are really dear to my heart. Wonderful are the wishes you sent me on my birthday. I am really grateful for the great friendship I have with people like you. Thank you for making me number on your list on my special day. I am so thrilled by the amount of love you showed me. Thanks once again for all those beautiful messages. I wish to thank all those who found it worthy to send their love across to me with their sweet wishes on my birthday. I am forever grateful for your kind heart. Let’s face it, guys, had it not been for Facebook, not too many of you would have remembered my birthday. It could be worse, though: I might have had to pay you. Thank you so much for the oceans of birthday wishes and messages you sent me on my Big Day. Now, I need to go back and continue reading them if that is okay with you. While thanking you for those lovely birthday wishes you sent me, I think it’s only fair that I also use this opportunity to extend my gratitude to Facebook for giving some of you who forgot my birthday the opportunity to remember it. Wow! We can build a whole company with social media handlers like you. Thank you for the constant update of my birthday on Facebook. Thank you for the virtual gifts on Facebook, you made my wall quite like a Christmas tree. I would have been happier with real gifts though. Thank you for freezing my phone with all your birthday wishes. I am looking forward to receiving one as gift from you. Your warm wishes made my day yesterday. Thank you very much. And on a serious note, I believe some of you can make a brilliant career as politicians considering how beautiful and sweet your lies were. 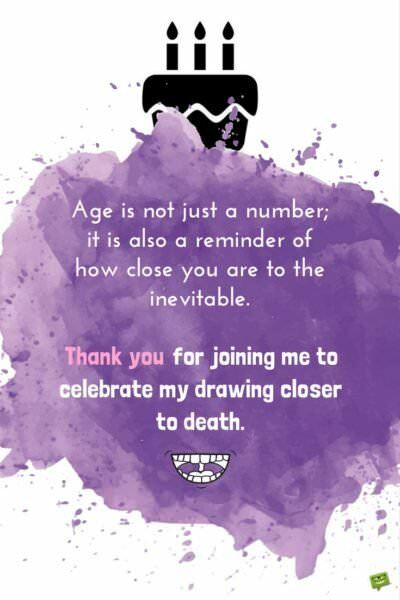 Age is not just a number but it is also a reminder of how close you are to death. Thank you for joining me to celebrate my drawing closer to death. Thank you for making my Big Day one heck of a joyous occasion. Your presence at the party left me with two things: wonderful memories and an empty bank account. It’s all good though since everyone will have their turn. Thank you, guys, for those sweet messages. And to all those who didn’t proofread their birthday wishes before sending them in, your marks will be sent to you very soon. Your wishes and messages on my birthday went a long way in making my day. Thank you very much. And by the way, all copied wishes were detected just so you know. Has anyone had more gifts than wishes on their birthday? The answer is a big NO. I knew I wouldn’t be the first to achieve that. 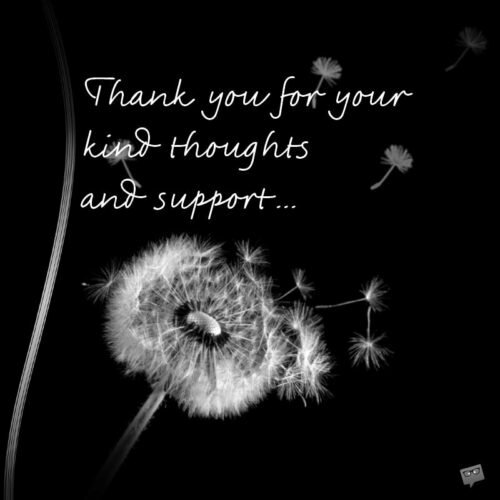 Thanks for your numerous wishes though. My birthday was the only time I realized some people were still alive. Thank you for sending in those beautiful wishes though. Can someone call me the ambulance? I am suffering from an overdose of wishes. Thank you all. My birthday was a headache; your wishes were the pill I just needed. Thank you. To all who wanted to impress me on my birthday, the standards were raised a bit this year. No more wishes without gifts! All the same, I guess a little thank you is in order for your efforts. Thank you everybody for gracing my birthday with your presence and wonderful wishes. 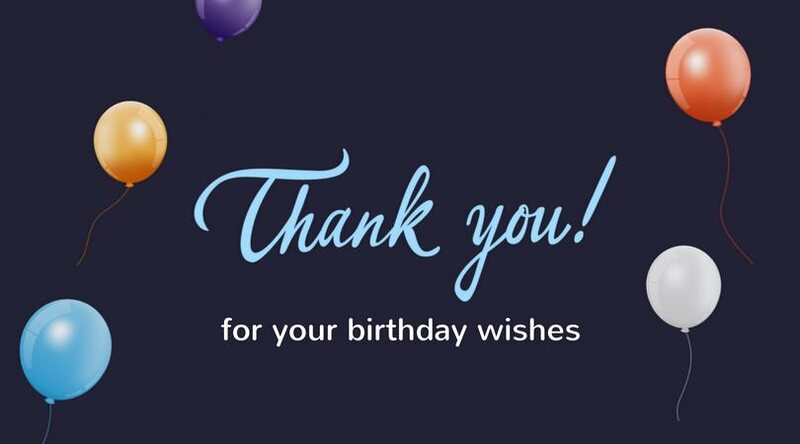 And to those who sent me copied birthday wishes, I just sent you a copy of last year’s thank you message. I want to say big thank you for two things. The first one is for making out time to attend my birthday party. The second is for drinking all my booze. It is a day after my fabulous birthday celebration, and I just want to use this opportunity to thank you all for not needing to rely on Facebook to remember that yesterday was my birthday. I know you would have still remembered my birthday even without any notification from Facebook. Age is not just a number; it is also a reminder of how close you are to the inevitable. Thank you for joining me to celebrate my drawing closer to death. Although my birthday party made me a little poorer this year, it was one heck of a memorable party. Many thanks to you, guys, for making that possible. No amount of money in this world would be equivalent to the feeling of nostalgia your wishes brought me on my birthday. I really miss those good old days when we used to hang out a lot. I’m feeling on top of the world right now thanks to your memorable wishes. I’m so grateful to you for taking time out of your busy lives to be a part of my Big Day and making it a memorable one for me. How I wish we could rewind time to those wonderful good old days. My birthday made me realize that I’m blessed with lovely people who care and think about me all the time. Thank you, guys, for your amazing love and support. Your wishes brought back those lovely times of the past which I terribly miss. Thank you for putting smiles on my face with your superb wishes. Thank you so much, guys. I wish someone could take me back to those beautiful good old days once again when life was really colorful. Thank you for your wishes. It’s always great to be thought of by good friends and loved ones. How can I return the beautiful gesture I received from wonderful friends like you?! You made my birthday truly glorious and reminded me once again of how wonderful you are. Now I cannot help but reminisce about the good old days with you guys. My birthday was nothing short of spectacular, and I owe it all to incredible people like you. Guys, you totally rock! It is times like this when I wish we could go back to the days when weren’t so far away from each other and could just meet and have fun. Those were some of the best days of my life. Birthday gifts will fade away with time but your beautiful words will forever be cherished in my heart. Thank you very much, guys! What I wouldn’t give for an opportunity to relive those good old days with you again! Those days were indeed golden. I am grateful to have been given the best birthday ever by my lovely friends. Your beautiful gifts and wishes filled my heart with so much joy and brought back wonderful memories of the past. I really miss those days, guys. 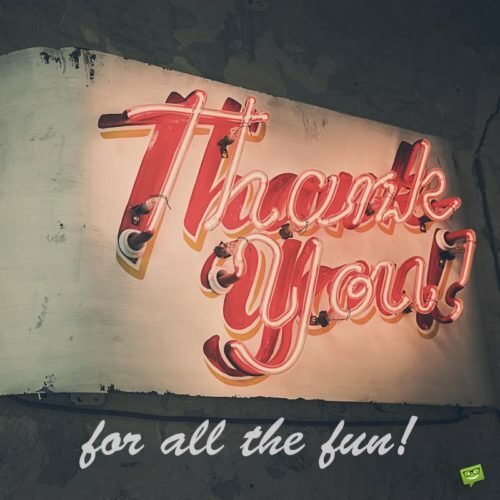 Sending a gargantuan thank you from the bottom of my heart to all the lovely people who made my birthday one of the most enjoyable occasions of my life. Thank you for bringing back the wonderful memories of the past. I miss those days when we used to spend hours together having the time of our lives. Guys, your wonderful birthday wishes filled my heart with great happiness as they took me back to those good old days when things made sense and life was full of fun moments. Thank you so much for that priceless gesture. I love and cherish you all. I can’t thank you enough for celebrating my special day with me because it brought back those treasured memories of yesterday and caused my heart to overflow with gladness. Guys, it is always a blessing to have people like you in my life. Thank you once again.